Dr. Reagan: What in the world is the Tribulation? How long do you think it will last? What is its purpose? Dr. Hutchings, please talk about the Tribulation for a few minutes. Dr. Hutchings: The Tribulation comes some time after the Church is taken up to Heaven in the Rapture. According to the Scriptures in Revelation 11:2-3; 12:14 and 13:5, we are given 42 months and then another 42 months. From that Scripture context along with Daniel 9:27, we know that the Tribulation period will be 7 years long. Jesus said those years would be a time such as the world has never seen, or never would see again. We just can't begin to imagine what it's going to be like. That will be the time when the Antichrist is ruling all the nations of the world, and the people are commanded to worship the Antichrist. We read about those who will not have food, and those who will be killed. It's going to be the most awful period, as Jesus said it would be. The Bible gives no reason for the Church to have to go through this period, and so we don't believe it will. There will be a one-world government, with all the nations being under the authority of just one person — the Antichrist and his kingdom. Everyone will be commanded to worship this person on the threat of death. Everyone will have to take his mark, which is the Antichrist's name and number, or they can't buy or sell. Already we see there is a big controversy now about mandatory computer chipping. Down in Texas one schoolgirl refused to wear a computer chip on her person. The kids are made to wear it at a particular school, and she said to the effect, "Well, I don't believe I should take that because the Bible says I shouldn't take it." Whether chips are involved, we don't know, but required marking we're already beginning to see. So, the Tribulation is going to be a terrible period. We read about the hunger, the wars, all the people who will die. We just can't begin to imagine the horrors which lie in store soon for the whole world. Dr. Reagan: What's the purpose of the Tribulation then? Dr. Hutchings: One, Israel will be brought to an understanding that Jesus Christ is the Messiah. Dr. Reagan: They are going to be brought to the end of themselves and finally turn to God. Dr. Hutchings: We read, "Behold He comes with the clouds and every eye shall see Him, and also they which pierced Him. And they shall mourn for Him as one mourns for an only son." That is not happening widespread among the Jews today. Dr. Reagan: What is the purpose for the Gentile nations during the Tribulation? What purpose does God have for them? Dr. Hutchings: The Gentile nations of course right now are all separate and worshipping different gods. It's not the world that God intended for it to be. It's a world where Satan runs rampant. The world will be prepared through the Tribulation period for the coming of Jesus Christ. The nations won't be nations anymore as such, being dissolved into the Antichrist's one-world empire. But, it won't last long, for the Lord Jesus Christ will come back to destroy that human kingdom and so will reign for a thousand years, according to Revelation 20. Nathan Jones: With the Tribulation, we read about the 21 judgments from God. We read about most of the earth environmentally being decimated. Most of the human population will also be decimated in just that seven year time span. If God then is a God of love and mercy, why would He do such a horrible thing? Dr. Hutchings: God is not only a God of love, He is also a God of justice. It's not a matter of God doing this, but Man bringing judgment upon himself. God has been storing up His judgment very patiently, giving people every chance possible to repent. But, when this period is over, the world will be ready for the coming of Christ. The world right now would not want Jesus Christ to come. Dr. Reagan: One of the things that has always really touched my heart in my study of the Tribulation is that the Bible clearly teaches that even when God pours out His wrath, His ultimate purpose is not to punish. His ultimate purpose is to bring people to repentance so that they might be saved. A lot of people are going to be saved during the Tribulation period because they are going to be brought to the end of themselves and so repent and turn to God. Dr. Hutchings: That is certainly true. We read in Revelation 7 about the 144,000 Jews who at the onset will evidently be believe and be saved. They will go out into all the world as witnesses for Jesus Christ. You just don't see that happening today, but it will happen during the Tribulation period. Dr. Reagan: That's right. It's just amazing to think that even when God pours out His wrath that His fundamental purpose is to bring people to repentance. Nathan Jones: It's a shame that it takes that much horror to bring people to finally accept God, though. Dr. Reagan: Well, it is, but that's just the nature of Man. Sometimes God has to hit us over the head with a 2x4 to get our attention. Dr. Hutchings: As you can look over the world today, especially here in the United States, 24 hours a day there's the Gospel being taught on the radio and on television. The churches are still open, even though according to the latest statistics church membership and attendance has been declining, not only in this country, but in other countries as well. Christians such as Dr. Franklin Graham recently brought out the fact that Christians are now coming under increased attacks, especially those who are believers from other nations all over the world. Dr. Reagan: Every time I think of the Tribulation I think of this verse in Isaiah 26:9, "When the earth experiences the judgments of God, the inhabitants of the world learn righteousness." 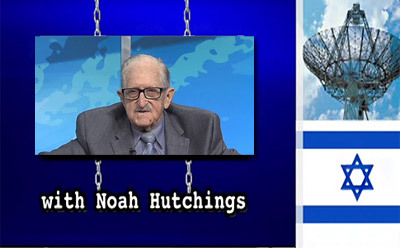 In the third part of this interview with Dr. Noah Hutchings on end time events, he'll explain what the Millennial Kingdom is all about. The European Union on Friday published new guidelines restricting interaction with Israeli entities beyond the pre-1967 lines. What can Israel do about this..Is there any way for them to stop the EU from enforcing this? Hi Nathan. . Billy. . Dr Reagan ... blessings to you and your families in Yeshuas name. . I have a question. .. it seems that (not all but some) messianic Jews teach that the church goes through the tribulation because they align their thinking with the exodus from Egypt. . Saying we.. just like the jews .. go thru all the judgments but with protection like when the plagues happened. .. what do you think about that? Susie, if believers are to be protected during the Tribulation, then what is your take on the "great multitude that no one could count, from every nation, tribe, people and language" (Rev. 7:9) that "come out of the great tribulation" (Rev. 7:14) who were killed during the 5th Seal (Rev. 6:9-11) which Jesus opens (Rev. 5:5)? Doesn't read like any protection's going on for these "great tribulation" (Rev. 7:14) believers. Also, Revelation 20:4-5 says they were "beheaded because of their testimony of Jesus" and "had not received his mark on their foreheads or their hands," indicating those at the altar are martyred for their faith in Christ during the Tribulation, both Jew and Gentile. Other than the 144,000 Jewish evangelists set apart and sealed (Rev. 7), according to the Bible believers in Christ will suffer immensely during that time period and are not miraculously protected as some would argue. This group of believers are not the Church, though, who have already been raptured to Heaven. Susie! Great to "see" you! God blessing to you, too. Why do you always have to shill for your guests. Telling us about how great they are sounds like you have to promote someone in order to attract readers. C.S. Lewis would say that he was an ordinary layman in the Church of England. Paul would say that He was a servant and prisoner. I am tired of the hustering. Just say what they say and as Isaiah wrote, God won't give his glory to another. let us decide not on man's accolades, but on the merits of what they say.